Here it is once again folks. Christmas has come around to us once again! Time to sit down and relax for a while with good food and company, I know for a fact I’m looking forward to putting my feet up. We would like to wish you all a Merry Christmas and a happy new year from all of us at Tenura, and look forward to seeing you in the future! Posted in Internet, Social Media, Tenura Updates, Uncategorized and tagged Tenura, Christmas, New Year, Daily living aids, independent living on 22nd December 2015 . As the holidays draw to a near we are forced to look back on the passing year, and what a brilliant year we have all had at Tenura! From exhibitions to big sales through our product range, we have been constantly working to provide you with as much knowledge as possible about what our products do, and how they can really make a difference in everyday life! Seeing as Christmas is coming up, we decided that now would be a good idea to tell all of you our shut down times over the festive period. Tenura will be closing down throughout the holidays from the 24th of December and resume normal operations on the 5th of January. We advise that all orders be placed before the 23rd of December, to ensure your order is on its way before the holidays begin. Another reason to get your orders in quickly is the current sales we are running till Christmas! You can get any of our products in the main range with 25% off, and there’s over a 50% saving on our cat and frog anti microbial table mats! Now would be a great time to buy, as they make great stocking fillers. For any questions or enquiries please feel free to contact us, we would love to give you the direction or help you may need. From all of us at Tenura, we wish you a Merry Christmas and a happy new year! Posted in Internet, Tenura Updates and tagged christmas, closing dates, tenura on 16th December 2014 . Another year has past, and we will soon be welcoming another New Year. For Tenura, it has been another year of great development, and we would like to thank you all for helping us get to this point. We will halt all retail operations on the 24th of December, and we re-open on the 2nd January. Any orders made in between these times will be fulfilled from the 2nd of January onwards. To make up for this, we are offering a 15% discount on all orders with the code ‘FESTIVE15′. Perhaps you could pick up a late Christmas present for yourself or a loved one? From all of us at Tenura, have a happy Christmas, and we wish you all the best for the New Year! Posted in Tenura Updates and tagged christmas, tenura on 23rd December 2013 . Another year has come and gone, yet for us here at Tenura, we can look back on it with some pride. Our first full year has gone exceptionally well if we do say so ourselves, and with big plans for the beginning of the year, 2013 is only going to get better. It still feels a bit strange that were in 2012…. At 5pm today, we will be finishing work for the year, downing tools so to speak, and will be returning in the New Year at 8.30am on the 2nd of January. The website will still be accepting orders, however please note that any orders made after 12.00pm on the 21st will not be sent out until the 2nd of January at the earliest, so please get those orders in if you need them for Christmas!! For those who may miss out though, all is not lost, as we are offering a 15% discount throughout the Festive period, just enter the code ‘FESTIVE15′ during checkout to get your discount. It starts today! and will continue until the end of play on the 2nd of January, an extra day to grab yourself some Tenura bargains. From all of us at Tenura, we wish you a Merry Christmas, and a Happy New Year. Posted in Uncategorized and tagged christmas, closing times, discount, new year, special offer, tenura on 21st December 2012 . It’s very close to the Festive season, the season to be jolly, and soon houses will be filled with celebration and cheer. There are of course, guests to tend to, the Christmas dinner to be prepped and cooked, and of course not forgetting the drinks to go round ( mines a bourbon please ). All this requires a lot of work, and a little help will go a long way. 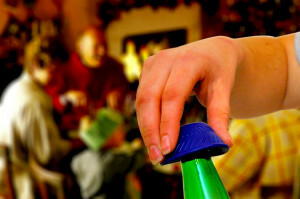 Tenura daily living aids can be used to open bottles, line trays to prevent food spillage, hold chopping boards, enhance grip on knives, you can put baking trays on it ( don’t forget to let that turkey rest! ) due to its heat resistance, as well as many other grip enhancing and anti slip solutions around the home. You can even kit out the dining table, our range of yellow, blue and red colours would enhance the festive cheer! All of our daily living aids are non toxic, so can be used around food, whether prepping or eating, as we have met and exceeded all regulations to ensure the material is safe for use in all areas, for all ages. Look out for a Christmas and New Year online offer coming to Facebook, Twitter, Google+ and the site itself. Posted in Assisted Living, Daily Living Aids, Independent Living and tagged christmas, daily living aids, special offer, tenura on 13th December 2012 .